The problem with Deadpool is that he just won’t shut up – or maybe that’s the reason for his success. Infamous for his profanity-spouting motor-mouth, the crimson warrior’s juvenile wit launched the relatively unknown character from comic book spin-off to the most unlikely box-office hero of 2016, shattering numerous records to the tune of over $750 million worldwide. Not bad for a relatively low budget R-rated film. 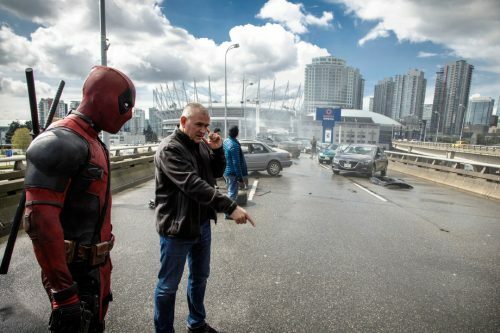 For director and VFX alum Tim Miller (Blur Studio co-founder), Deadpool was a passion project requiring several years of studio pitching before he could get Marvel’s most outrageous character onto the big screen. To realize his vision, Miller needed a VFX team that could deliver on the brash, balls-to-the-wall insanity coursing through the comic’s veins. Enter Atomic Fiction. Read on to learn how Atomic Fiction ensured the success of Deadpool’s debut by taking a page from the Merc with a Mouth himself: they just kept talking. Atomic Fiction’s work on Deadpool consisted primarily of two major sequences found at the bloody heart of the movie. 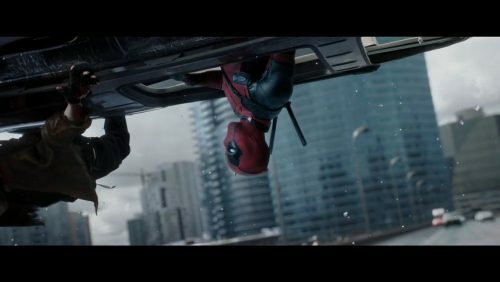 The first is a high speed chase that incorporates tumbling vehicles; bone-crunching violence; and the occasional pause in momentum to allow for the delivery of Deadpool’s patented fourth-wall-breaking one-liners. Atomic Fiction’s main priority was developing the surrounding CG city, ensuring that it felt 100% photoreal when placed into shots filmed from the car’s interior. The studio’s close relationship with Deadpool VFX supervisor Jonathan Rothbart certainly helped in getting things just right. As Rothbart was one of the founders of Orphanage – a San Francisco-based studio where many members of Atomic Fiction previously worked – a transparent relationship quickly formed between Rothbart and the team. It was that relationship, facilitated by cineSync, that really kept communication open throughout Deadpool. “Aside from phone calls and texts between Jonathan and supervisors on the Atomic Fiction team, we’d have official cineSync reviews once or twice a week depending on what stage of production we were in,” explains Gibbs. “With the car chase sequence, we had to examine a lot details shooting through the frame at high speed. The animation of the SUV caravan in world space was continuous from shot to shot, meaning they were actually moving through a 3D city, not looping back over the same stretch of road over and over. 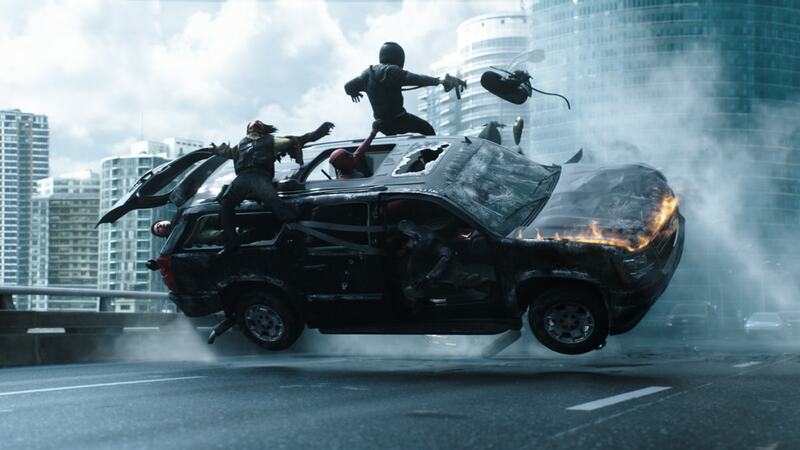 Atomic Fiction’s second scene takes place directly after the freeway chase, as Deadpool tackles a gang of villainous goons in a balletic display of martial arts and spectacular gunplay. Atomic Fiction had to ensure that Deadpool looked his best. It was here that working with director Tim Miller, with his extensive background in visual effects, offered a refreshingly clear perspective. For Gibbs, cineSync is one of the major reasons that the Atomic Fiction studio has been able to stay lean and work productively with a relatively small team. “All of the meetings and reviews that occur on a day-to-day basis on a project like Deadpool are held cross-site – that means we need an efficient way to interactively discuss material with all groups on the call,” he explains. “Also, our supervisors are required to frequently travel to set or between studios, so being able to review takes on the run is essential. cineSync allows us to do this, no matter where in the world the team may be. Although he’s now been using it for some time, Gibbs continues to find helpful tricks nestled away in cineSync’s comprehensive toolset, allowing him and the team to tackle increasingly more complex projects like Deadpool. As the studio moves from one blockbuster to another, with work on Star Trek Beyond and Pirates of the Caribbean: Dead Men Tell No Tales lined up for the team, cineSync will continue to be an essential resource for the Atomic Fiction team.